While there are documentary films that would fair commercially better being released on a streaming service than compared to having a theatrical release, the beautifully shot, vertigo-inducing experience of the rock-climbing documentary Free Solo is deserving of patronage to the biggest cinema screen available. 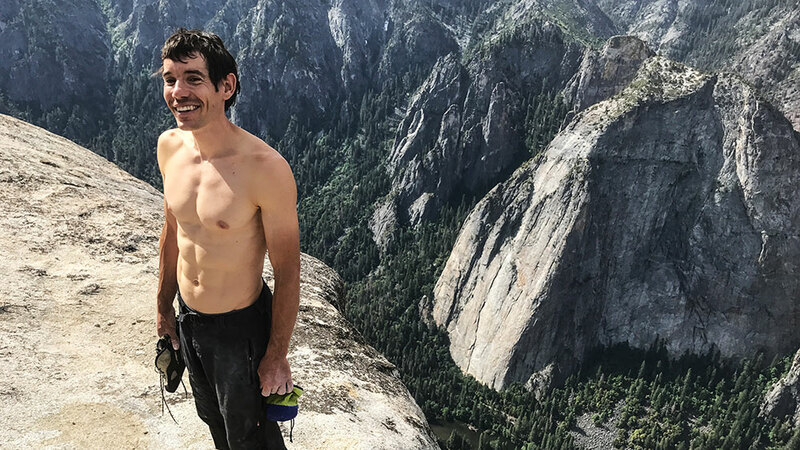 Despite his achievements, rock-climbing-rock-star Alex Honnold is regarded as both a freak-of-nature and a show-pony in the rock climbing world, with his attempts at the incredibly dangerous climbing method of free soloing – rock climbing without safety equipment – considered crazy and extraordinary. Free Solo not only displays Alex’s climbing abilities but is also an examination of Alex’s decision to document his climbing attempt of El Capitan; a 3,000-foot-tall cliff that had yet to be free solo climbed and is described as the greatest wall on Earth. Alex does not stare at cliffs, he studies them, impressively memorizing every crack, crevice and detail to the point where it can be recited as if it were on the back of his chalky hands. Being earthbound tortures Alex more than the extreme pain of free soloing, with the documentary able to effectively establish climbing not just as a hobby, but as a mentality that is equally as important as the gruelling physicality required to complete the El Capitan climb. Living with the mindset of the failure being worse than the fall, Alex displays anti-social behaviours with the development of personal relationships considered secondary to climbing. Alex, to the irritation of others, assesses the value of people in his life in terms of how they inconvenience him, using words such as adequate and the amount of space they occupy to evaluate whether they can attach themselves to his life. Free Solo’s ongoing dissection of Alex’s extreme dedication borders on the tedious and were as if the film itself were exhausted mid-summit and unable to make new ground. The focus on Alex’s neuroticism sees the film become stuck in portraying Alex as frustrating, gearing towards a difficult-to-grasp belief that his extraordinary climbing abilities justify his dissociative and neglectful tendencies. The willingness of Free Solo to explore the moral dilemma held by the filmmakers to capture his efforts enables the film to have an interesting conversation within itself about the ethical obligations of broadcast in a camera-at-the-ready society. Opinions of Alex held by others in the climbing community – who should welcome achievements within the field – make for an intriguing point of discussion with many fellow climbers lambasting Alex’s motivations as not being for the thrill of the climb but for the acknowledgment from the world that he made it to the top. Like the sensation of falling backwards on a chair, Alex’s climb of El Capitan is terrifying-yet-enthralling, with the possibility of a drop being heightened by clever decisions to include Alex’s rhythmic breathing as part of the score along with shots involving birds nearing him during his ascent. A feeling of vertigo is maintained throughout the El Capitan climb with the use of close and wide shots that where needed, contrast Alex as a speck against the enormous cliff face and showcase the ease of one misplaced hand or foothold resulting in Alex plummeting to his death. Shots of nature are of an editorial quality and capture an ironic sense of beauty within most frames, ranging from the visually dazzling forest shots (as expected for a National Geographic produced film) to the frightening dizziness of looking down on El Capitan. Despite some narrative plateauing, Free Solo is an exhilarating ride that offers a unique look at eminence in an Instagram-world (and had the film titles been available, could have too easily been called Vertigo, Cliffhanger or Gravity). 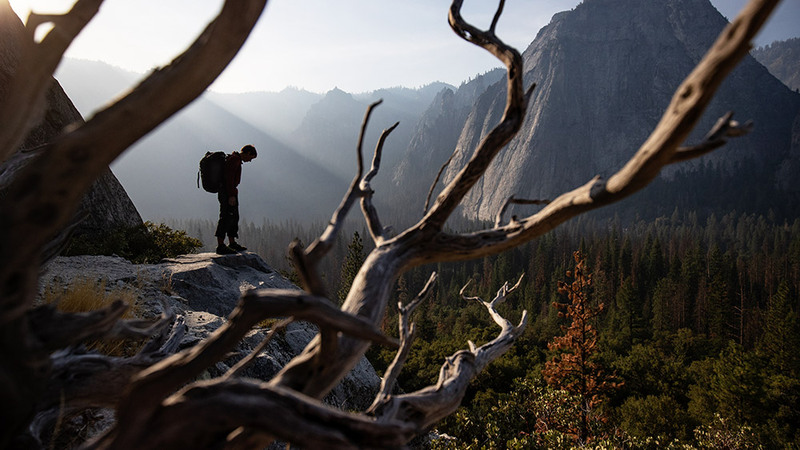 Alex Honnold has done the triple crown of climbing in Yosemite. El Cap, Half Dome and the Mt. Watkins.